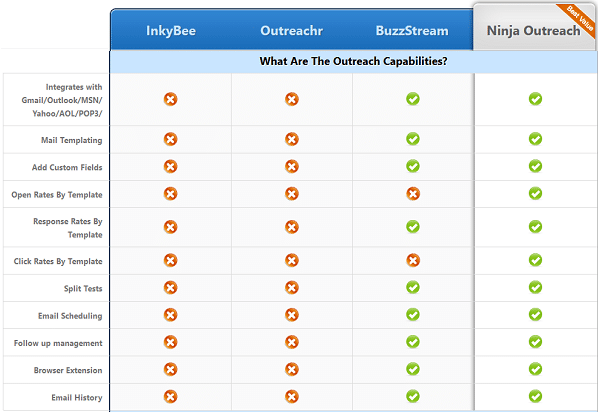 Product Analysis | What Makes NinjaOutreach Different? "What makes your product different?" Of course there are many different ways to answer the question, but I always think the most appropriate way is to answer it from the perspective of the customer. 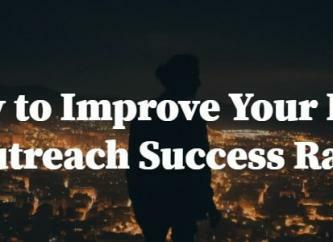 For example, to say that we have a better marketing strategy, or that we're better at SEO, or that we have a competitive advantage due to our network may be a valid answer from a business standpoint, but I would never explain it that way to a customer. Because better SEO doesn't mean anything to the customer experience. A customer wants to know about pricing, product, and support - what makes it different FOR THEM, and why should they buy it over the other guys? 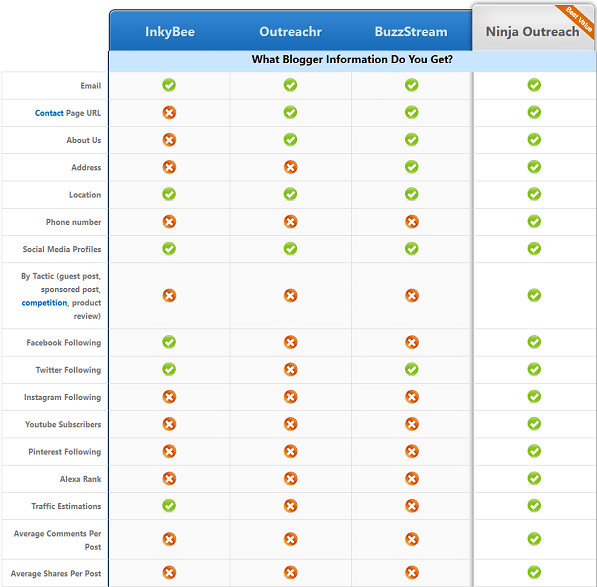 Ninja Outreach currently is the cheapest blogger prospecting and outreach tool on the market, at all levels. While this may not always be the case we are pricing it at such a level that it is affordable for large agencies AND bloggers. 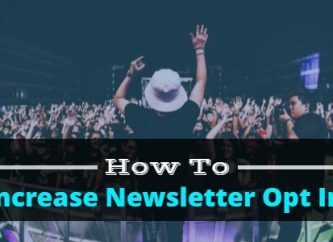 We have built a software that we want everyone to be able to use because blogger outreach is not just for 10 man outbound teams, but also for individuals who are looking for guest posting opportunities and ways to promote their content. A main problem in the space right now is an abundance of data and tools, many of which serve a purpose, yet no one way to bring them all together for a single process. Blogger outreach is a complex process. Every individual's and client's needs are different depending on what they value more; social following, SEO, location, etc. We have brought all of that under one roof so that you don't have to go digging or make incomplete estimates based on foggy data. 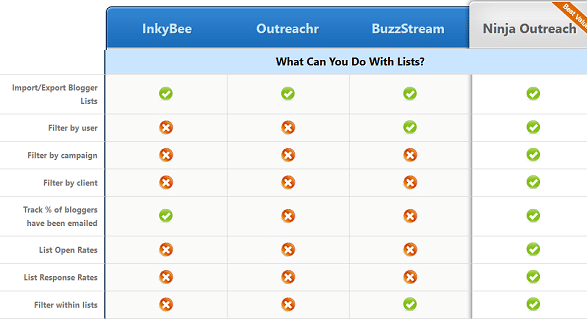 It is the most complete blogger prospecting tool on the market, and the below image is just a portion of all of the data we provide. Data is great, but you need to have the ability to sort through it. This requires an advanced filter. Few tools really offer this, and those that do often restrict it to several key pieces of information. Again, why not let the user decide for themselves what is important? We've made every piece of data filterable, even the availability of contact information, so you can directly hone in on what matters. A major pitfall I see over and over again are purely prospecting tools. 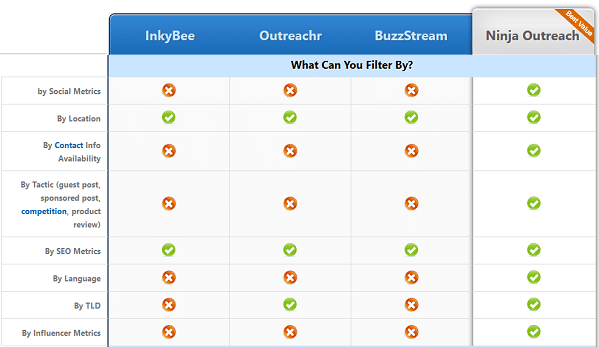 If you are doing prospecting you are probably doing outreach, which means you want email integration capabilities. We've designed our tool to integrate with several email clients, so that you can message the same bloggers you are prospecting, wiithout having to export those lists. But it's more than messaging - it's setting follow up reminders, it's creating and split testing templates, it's adding custom fields. Many tools offer the ability to prospect an unlimited number of contacts, few give you the organization capabilities to really manage thousands of bloggers in one place. It's easy to lose sight of who belongs to what campaign, which was assigned to which team member. Every list you create is filterable on metrics such as the client, the assigned team member, and the campaign it belongs to. Additionally, we provide statistics at the list and campaign level, so you know how many bloggers have been contacted, and what those response rates are. 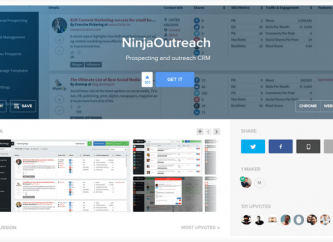 Our goal with NinjaOutreach is to create the complete blogger prospecting and outreach tool. We are passionately committed to adding necessary functionality, in a user friendly way, and will continue to do so as the product evolves over time. Perhaps we can do another product analysis next year.